In a food processor, process the flour, sugar, salt and butter together until it resembles a fine crumb. Whisk the egg yolk with the water and pulse into the mixture until it just comes together. Do not over mix it. Dump the mixture out, then gather and push the dough into a large ball. Press the dough into a disc shape, wrap in plastic wrap and chill while you make the apple filling. Melt the butter in a cast-iron skillet. Once melted completely, stir in sugar and vanilla for 3 minutes. Arrange apples in a spiral pattern, taking care to overlap them. Cook gently, stirring and tilting the pan as the sugar mixture caramelizes and the apples produce liquid. 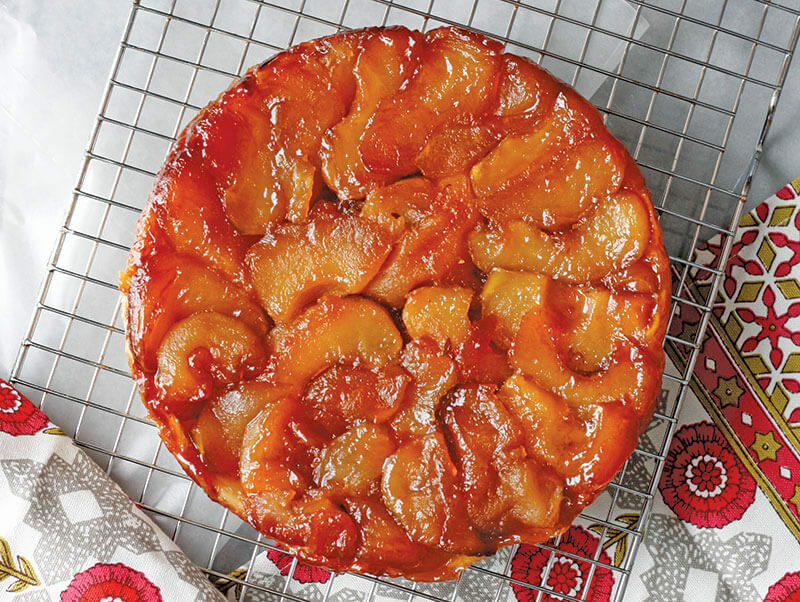 Once the apples are tender and the syrup is thick and golden, after about 20–30 minutes, remove from heat and place on cooling rack in fridge for 20 minutes. Preheat oven to 425 F.
Once cool, rearrange apples back into a spiral pattern. They do not have to be as overlapped as before as they’ll have shrunk in size. On a lightly floured surface, roll out the dough and cut a 1-inch disc just slightly larger than the diameter of the pan. Place the disc over the top of the apples, tucking the edges in and under the apples. With a sharp knife, poke a series of holes into the dough to help release steam as it bakes. Bake the tart, skillet and all, for 25 minutes until the dough is golden in color. Cool for 5 minutes, then turn out on cooling rack. Place any apples that stick to the pan back into place. Enjoy!